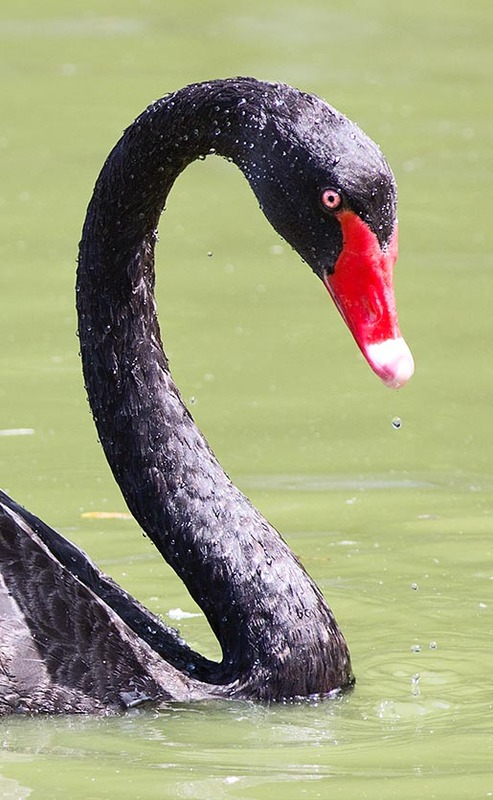 The Black swan (Cygnus atratus Latham 1790) is an aquatic bird belonging to the order of the Anseriforms (Anseriformes), to the family of the Anatids (Anatidae), to the genus Cygnus and to the species Cygnus atratus. The name of the genus “cygnus” comes from the Latin “Cygnus or Cycnus” (derived from the Greek “kuknos”) son of Sthenelus, King of Liguria. Cygnus was inconsolably afflicted by his friend Phaethon demise (also Phaethon has given the name to a marine bird) and for this reason was transformed in swan. In a second version, “Cycnus” (with the “c” in lieu of the “g”), son of Apollo, in a fit of rage and for avenging on himself the death of the homonym Cycus, Neptune’s son killed by Achilles, jumped off a cliff of the mount Teumessos and was transformed in swan. The name of the species “atratus” comes from the Latin “atrata/atratus”, which means “in mourning clothes” and is referred to the predominantly dark livery of this species. Typically Australian species: along with the emu (Dromaius novaehollandiae) and the Laughing kookaburra (Dacelo novaeguineae) is the most widely known Australian bird, present in the mythology of the Aboriginals. It is the national bird, shown also on the national emblem of Western Australia. It is a monotypic species; the black swan has been discovered by Dutch explorers close to Perth in 1697. The species has been originally introduced in New Zealand in 1864; partly for trying to contain the cress (Lepidium sativum) also introduced and which is excessively suffocating the waters.The black swans did thrive in New Zealand becoming unwanted; they were hunted up to the point of even collecting their eggs (in 1966, from the Ellesmere Lake only they did collect more than 43.000 eggs). The present New Zealander population counts some tens of thousands of specimens. The black swan has reached spontaneously, around the 1865, the Chatham Islands where nowadays live some thousands of individuals. The extinct Chatham swan (Cygnus atratus summerensis) has disappeared, between the 1590 and the 1690, probably due to the excessive hunting done by the Māori long time before the arrival of the Europeans. This ecological niche, left vacant, has been later on, rightly, colonized by the black swan. The species has sedentary or erratic-wandering habits related to water and foods availabilities. They live in a great variety of habitats even if the water fast currents, where the currents or the turbidity of the waters prevent the growth of the aquatic vegetation, are normally avoided. In addition to the wet environments with aquatic vegetation, they can feed also on dry grasslands and on cultivated fields. It is a strongly gregarious species which can form flocks of tens of thousands of individuals in suitable lakes in southern Australia and in New Zealand. Many specimens live in urban lakes where they are commonly fed by the people: in Perth, on Monger Lake, groups of tourists arrive expressly for nourishing these swans (with some minor problem in case of presence of protective pairs of swans accompanied by their progeny). Also this swan, with an average length of 140 cm, a wingspan between the 160 and the 200 cm and a weight of about 3700-8700 g, is an imposing bird. The livery is mostly of smoky slate black colour; especially the dorsal feathers (scapulars, coverts) present a sort of slightly paler margin creating slight edges visible when the bird is close. In spite of the common names given to this species that refer to the fundamentally sooty-black colouration of the livery, the black swan presents also primary and secondary flight feathers of a shining snow white colour which evidence when the bird is flying. This white portion “flashes” brilliantly and in a contrasting way with the black plumage. It has, furthermore, the major and tertiary coverts of the wing unique; ample, rippled elegantly fringed and curled forming a sort of a “mantle” neatly ruffled. The black swan is equipped with a conspicuously long neck, more than the body, particularly evident in flight. This specie has the longest neck, proportionally to the size of the body, than all the extant species of swan. The necks, long and sinuous, may assume movements and forms almost serpentiform. The eyes of this species have a penetrating bright red colour, but at times they may be pink or white (for some specimens the variation of colour light reflect the actual reproductive condition). The beak and a narrow portion of bare skin (quite slightly in relief) that from the base of the beak reaches the inner commissure of the eye are of a nice brilliant coral red colour. The superior rhamphotheca, distally but before the tip of the beak has a white transversal stripe; after such stripe, the apex and the nail of the beak are pinkish. The legs are blackish and can have slight flesh-coloured shades on a dark base. The immature juveniles have a paler colouration, opaque brown-dark brown, iris not red but brown and do not have the triangle of red skin reaching the eye. The maturity is reached at about 2-3 years of age. The black swan, in its behaviour, resembles the Mute swan (Cygnus olor) even if being more gregarious and sociable than this last. 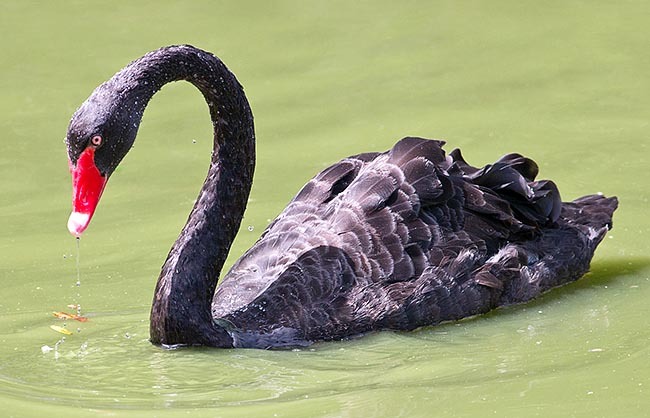 The black swan has an awkward gait when on the ground and is extremely elegant in the water. Usually, when swimming, it carries the basal portion of the neck leaning against the upper part of the back. The neck is carried completely erect in the specimens on alert. It has a strong and slow flight with powerful wing beats; the wing beat produces whistles and quite audible hums as a consequence of the fast passage of air through the margins of the primary remiges. For “taking off” the black swan (as is the case of other swans), must tap and run on the water surface for about 40-50 metres before reaching the required speed for taking off. For this reason, very small water streams or basins covered by excessive vegetation, which renders the take off difficult, are avoided. When the flocks feel a danger and get alarmed, the first wing beats, exposing the white feathers, serve as signal starting a rapid escape of the whole flock. The flight formations are V-shaped or are a sort of long hanks; often the longest flights are done during the night. They emit not too strong, acute, squeaky, melodious-plaintive and repeated vocalizations. 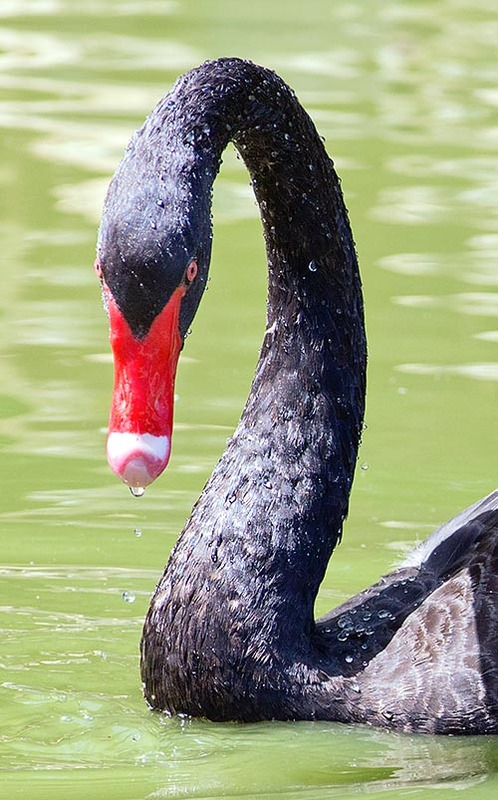 The black swan has a manly vegetarian diet (small animals may be ingested along with the grasses) nourishing mostly of aquatic plants (thanks to the long neck it dips for catching them) and of vegetables and seeds growing along the banks or on the solid ground. The specimens fed by the man nourish of grains and their derivatives and of various vegetables. The wild populations, if the ambient conditions are favourable, may reproduce all over the year and the nursing of the progeny is influenced by the level of the water in the nesting sites. The specimens bred in Italy (Europe), for ornamental purpose, tend to spawn more n autumn-winter keeping the origin seasonality. Among the various species of swans, the black ones are the least territorial and at times they nest in rather dense colonies as is particularly the case in Tasmania and in New Zealand on the coastal lake of Ellesmere. The pars can assume menacing postures raising the wings arched and evidencing the white portion. The males of adjacent territories may get close to their mutual boundaries touching each other, at times, with the chests and the heads delimiting a heart-shaped space. This attitude combined with the swimming back and forth, can be common but real and true fights are not frequent. 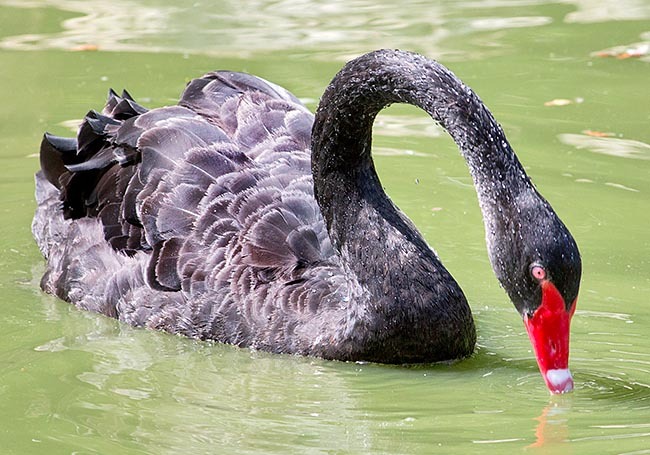 During the courting, the black swans open vocalize in duet emitting noisy and pretty repeated “piiiiiip, piiip” and wrap partially the necks between them. Often, they dip the necks in the water and raise sprays making various attempts to mount. In the black swans the pair links are weaker than the other species of swans, and the pairs, in crowded colonies, may be rather promiscuous. At times, some breeding trios do occur. The nests, large and sometimes messy, are located directly in the water or in its proximity in the banks vegetation or on small islands. The aquatic nests are usually bigger than the terrestrial ones. When in water, the nests are usually anchored to rooted plants; but may detach and become sort of floating rafts with the swans who usually keep however hatching even if moving. At times the material utilized for the nest is not the best and decays, gets heavier and sinks the nest itself. Often the first pars reaching a nesting site occupy the best positions formed by the banks with shallow water; the pairs getting there later on are obliged to settle in zones gradually deeper where the tightness of the nest becomes more and more uncertain. As we said before, the pairs forming the colonies are necessarily relatively little aggressive also if, f very close, they tend to steal each other the material for building the nest reaching the point to destroy the nests each other. This practice has the consequence that often there are eggs scattered and abandoned in semi-destroyed nests; even if most of these eggs is at times lost, and in case of adjacent nests, they are carried away into the nearby nests and hatched. The eggs are grey-opaque bluish. The hatching lasts about 36 days, even if it seems that some wild pairs, in Australia, take even some more days for opening the eggs. Also for the hatching the black swan differs from the other species because both partners brood: the male hatches manly during the day and the female mainly the night. Many exceptions to the rule of the hatching time, at least in captivity, do exist among the reproductive pairs: in some broods only the female, in others the male contributes from very little to a little or up to much, to reach limit cases where the male broods alone or almost. In the wild, the biggest menace for the success of the hatching is formed by the floods. Also the predators are a danger for the broods: Swamp harriers (Circus approximans), Australian raven (Corvus coronoides), White-bellied sea eagles (Haliaeetus leucogaster) and rats (Rattus spp.) regularly predate eggs and cygnets. In Chatham Island (New Zealand) the eggs are predated by the Woodhen (Gallirallus australis) and in Tasmania one of the most diffused predators is the Tasmanian devil (Sarcophilus harrisii). The nests and the cygnets are defended emitting noisy whistles, utilizing wing beats and attacking the potential foes. If, during the hatching, they are disturbed by very dangerous predators the brooding swans get down from the nest and go away with their head held low. The cygnets, upon their birth, have a pale ash grey down with dark-grey-blackish legs and beak. In the colonies, some broods, even of different age, are merged and amalgamated; in these cases (a case is reported of 40 cygnets) it appears that only one pairs is taking care of the whole “widened” brood. The composition of these nurseries may continuously vary with chicks moving from one group to another so much that the pairs caring the groups of cygnets may not even have any biological son in the group they care. The newborn cygnets, in water, can climb on the back of the parents for being transported. The age of the flying off can vary between three and more than five months. The moult can be variable depending on the changes of the rain seasons; often big groups aggregate, for the moulting, after the reproduction. After the nursing some swans become errant, others are sedentary. Generally this species is protected in the origin territories even if locally it may be limitedly hunted due to the damages it causes to the cultivations. The black swan due to its beauty, pleasantness (the typical greeting of the duet is often addressed also the persons) and its prolificity is bred in the whole world so much that, out from the origin area, it is often possible to encounter escaped or freed individuals. From the bred subjects they have gotten also specimens having different colourations: white, grey-light blue, dappled.